If you're in search of a big, roomy sedan that won't break the bank, the 2010 Chevrolet Impala will thoroughly meet your needs and probably exceed your expectations. The wide range of available OnStar packages gives the Impala a leg up over similarly priced competitors. If possible buy new and not used. I purchase this vehicle because the one I was driving was wrecked. I like the color white and had to get use to driving a car that was not a Ford. One of the issues that I have is that it is not a roomy car and it has no cups spaces in back and it is an uncomfortable riding car. This type of car is really for a young couple with no children. Being up in age I would have preferred a car with more room in it. Buying a car used is a handicap because there is no warranty or it is limited and you cannot afford to put a warranty on the car. When you are older unless your credit is good or excellent you really have to search to find a company that will take you. It took us 6 hours and 25, 000 dollars to find a company that would process the car. As far as the size of the car I like the size but needed more room in the passenger side. In these older models the CD and radio has a glitch. It will play the radio but the CD may play or not play. If it was possible I believe that if the vehicle was purchased new I would have enjoyed changing from a Ford to a Chevrolet. Beautiful car, but beware! Anything produced during the time of GM's crisis, (when the government had to bail GM out) may come back to haunt you! Newest auto I ever owned, with 5,000 miles on it. Hertz rental. Four years old and 27,000 miles doors started rusting out. After much debate, GM approved 4 NEW doors. Now 4 years and 27,000 additional miles added, the 4 new doors are showing rust! I have kept my car in brand new condition and just turned over 43,000 miles for a 2010. I am more than angry, but I actually expected it. Read online from body shops that during GM's crisis years ago, they cut corners and doors WERE NOT treated and sealed as they should have been. If they replaced the first 4 doors with the same defective doors, I guess that the fact that they are rusting out again, should be no surprise. At the time I asked the dealership, "How can I be sure the same thing will not happen to the new doors?" I was told they would be treated with something special, so it would not happen again! Newest car in my 73 years on this planet and this is what I get from GM! The Chevrolet Impala is a dependable vehicle, great for a growing family! Overall, I love my vehicle. The Impala has been trustworthy and reliable on long car rides. It can fit three car seats in the back seat which is nice as a mother with a growing family. The leather seats in the back scratch easily with car seats being taken in and out, but it is easy to find seat covers that fit nicely in this particular vehicle. 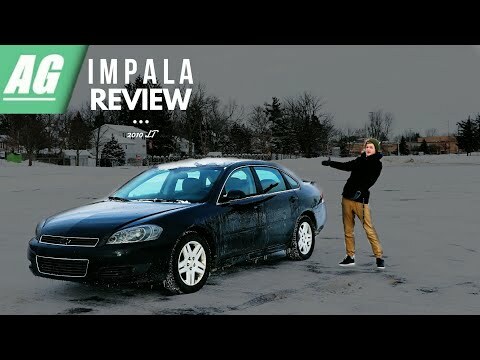 The Impala also drives well in the snow. Living in the north, bad weather conditions in the winter time can cause great concern for traveling. The Impala has been trustworthy and got me and my family safely over 200 miles in a snowstorm to my parents house. The one thing that has been unfortunate is that one of the parts under the dash decided to start clicking. My husband is good with cars and was able to get it fixed, but when we googled the issue we learned that most owners of Impalas have had the same issue. The good new is that it is an inexpensive part and relatively easy to fix.